regulations that builds on our past experience of field work and Remote Monitoring. Weekends, holidays, the middle of the night, the need for support never occurs at convenient times, and everyone is aware by now, the Environmental Protection Agency (EPA) has promulgated the Compliance Assurance Monitoring (CAM) rule, placing greater demands on compliance issues and plant resources. How can you find service support when you need it? It is only a phone call away. The engineering staff of TRK Engineering Inc. specializing in ESP start-up and operation, including a solid background in process condition. TRK Engineering’s Remote Monitoring Service can make your ESP modem connection a valuable component of your maintenance team. By using a modem on your system, information can be used by TRK Engineering to reduce any problem situations to a minimum occurrence, as well as add credibility to Title V/CAM reporting. Think about it, you can save on travel cost, maximize production, and use the reports as part of your semiannual reporting. 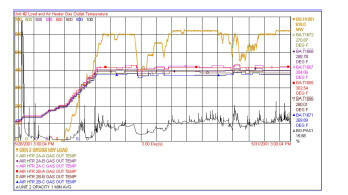 We can offer an array of services covering AVC and process troubleshooting to ESP computer performance modeling. Need assistance with your CAM reporting? The electrostatic precipitator (ESP) performance model will provide a useful mechanism for evaluating the performance of ESP's under the CAM rule of your Title V permitting. Click here or on the titles below to find out more. PRESS the "BACK" icon on your browser to return to this page for more selections. Example of real-time operational analysis. What Remote Access can provide? Last updated: May 10, 2009. Copyright © 1997 TRK Engineering Services, Inc. All rights reserved.